Can I order a MedCenter System with XL Pill Boxes instead of the standard 4"? Right now we do not have the original MedCenter System available with the larger XL Pill Boxes. We do however offer the XL System which includes our upright Organizer stand, a full 31-Day set of our XL pill boxes and the original MedCenter Talking Alarm Clock. This item can be found under our "Extra Large Pill Organizers" tab at the top of our website. Do you have larger Pill Boxes available? Many of our items are available with our 6" XL Pill Boxes. Items utilizing this pill box can be found under the "Extra Large Pill Organizers" tab at the top of our website. How many pills / vitamins fit inside a Pill Box compartment? Our new larger XL Pill Boxes (used in all products denoting the "XL" size pill boxes, also available as an accessory to the exisitng MedCenter System) have an individual dose compartment which measures roughly 1 3/8" wide x 1" long x 3/4" deep on the inside. 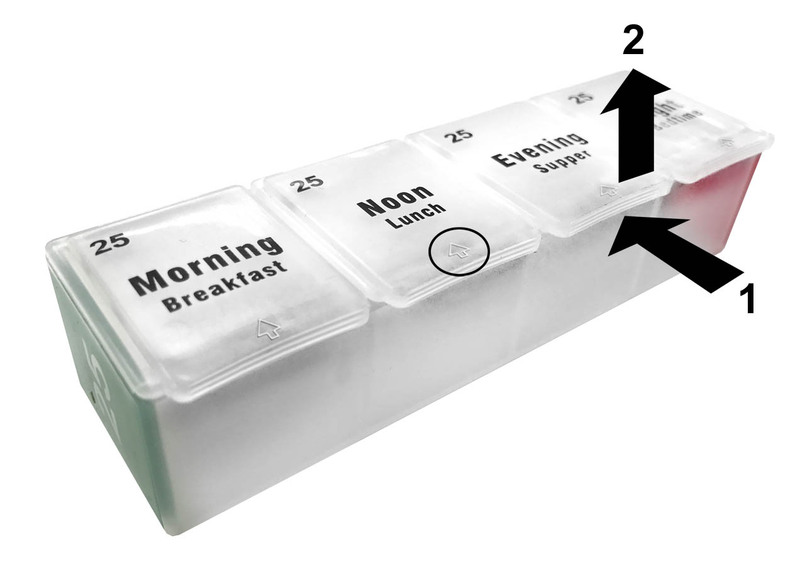 Each of the new XL Pill Boxes contain four of these dose compartments. The pill box lids feature a safety catch to prevent the pills from accidentally falling out when the pill boxes are transported and/or stored upright in the system. To open and disengage the safety catch, a small arrow is molded into the lids directing you to push back, then lift up. The front edge of the pill box is curved and textured as well to assist in this motion. By design, the pill boxes only require a minimal amount of effort to open when using this method making them very easy to open yet secure, with our older users in mind specifically.